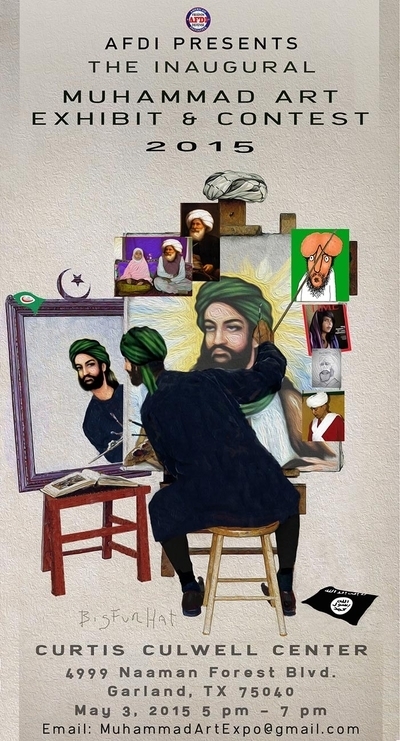 Sunday's shooting attack on a Muhammad cartoon exhibit and contest in Garland, Texas appears to be a largely spontaneous reaction to an "unprecedented avalanche" of vicious social media posts sent only a few days before the event from jihadists around the world urging massive violence including the murders of the events' organizers and all others in attendance, a law enforcement source told the Investigative Project on Terrorism. The gunmen, identified as Phoenix, Ariz. residents Elton Simpson and Nadir Soofi, drove up to the Curtis Culwell Center as a Muhammad Art Exhibit and Contest was wrapping up Sunday evening. They started firing automatic weapons as soon as the left Soofi's car, wounding an unarmed security officer. A Garland police traffic officer who was with the injured man returned fire, killing Simpson and Soofi, police say. The event was organized by the American Freedom Defense Initiative, an organization headed by free speech advocate and writer Pamela Geller, and featured a speech from Dutch Parliamentarian Geert Wilders. The contest received over 300 entrants competing for the $10,000 top prize. 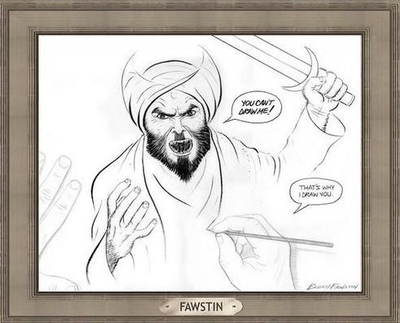 The winning entry shows an image of the Muslim prophet Muhammad brandishing a sword, commanding, "You can't draw me!" The cartoonist's hand responds, "That's why I draw you." The event was spurred in part as a reaction to the Council on American-Islamic Relations (CAIR) "Stand with the Prophet" conference in January in which radical Islamic leaders from around the United States attacked those who have "defamed the Prophet" as responsible for the rise of Islamic extremist groups and the "world wide hatred of Muslims." The CAIR-sponsored event in Garland took place in January of this year just after the Islamic terrorist massacre of the cartoonists working at the Charlie Hebdo satirical magazine in Paris. Geller's event also sought to commemorate the victims of the Paris attacks. According to the IPT source, social media postings about the event began appearing en masse about three days earlier. They featured vicious exhortations to kill those responsible, urged beheadings and mass killings. Simpson, who court records show had a long affinity with jihadist causes, apparently saw some of those calls to violence and headed to Texas intending to kill as many of the Garland conference attendees as possible. It is not yet known what prompted the late-hour focus on the Garland meeting within foreign jihadi circles, but investigators are confident Simpson and Soofi were trying to respond to those specific calls for jihad. At this point, authorities do not believe the attack was well planned or that Simpson and Soofi ever conducted reconnaissance on the Culwell Center before coming out guns blazing. If they had, they might have discovered that organizers, well aware of the inherent threat of violence an event like theirs carries, paid $10,000 to hire off-duty police to provide security. That was in addition to the security provided by members of Garland's SWAT team, along with FBI and ATF agents. On Friday, the FBI issued an intelligence bulletin in Texas downplaying the possibility of any violence that could erupt, the IPT learned. The FBI said in the classified bulletin that no evidence had surfaced in the United States from any sources that there was any credible threat of violence at the Muhammad Art Exhibit and Contest. However, another intelligence unit in Texas disagreed with the FBI assessment and issued a different intelligence warning citing a "massive amount of overseas incitement to carry out violence on social media." The calls for violence—including exhortations to "destroy Texas" from Islamist-sympathizers in Europe. A strong police presence was at the Garland center as a precaution, and that stopped the heavily-armed gunmen from carrying out their dream of massacring those inside. Toward the end of the AFDI event, a car sped up to the Culwell Center and the two gunmen began firing AK-47s. One security officer was hit in the leg but did not have life-threatening injuries. "Had it not been for the quick reaction of this [officer], the outcome of this episode could have been different and a lot more like Paris," a second official told IPT. "We cannot be 100 percent sure at this point but it seems like these guys were on suicide missions," said a third officer. "They clearly did not have an escape plan." A message posted to Twitter minutes before the shooting carried the hashtag "#texasattack," and included what appears to be a pledge of allegiance to the Islamic State and asked "May Allah accept us as mujahideen," or holy warriors. Geller and co-organizer Robert Spencer were immediately whisked into police protection (Wilders had already left the venue). A crime scene was established surrounding the car and the bodies of the two perpetrators. Simpson was charged in 2010 with lying to the FBI about planning to travel to Somalia to join the al-Shabaab terrorist group. He was convicted of that in 2011, but sentenced only to three years of probation and supervised release, records show. He was given his passport back after his attorney petitioned the court after his conviction. Records from that investigation, however, show Simpson was a man who discussed jihad against the West and martyrdom for years. He came to the FBI's attention in 2006, due to his association with another person suspected of trying to establish a terror cell in Arizona, U.S. District Judge Mary Murguia wrote in a 2011 decision. The FBI sent an informant in to befriend Simpson and record their conversations. Among the things Simpson told the informant: Allah loves those who are "'out there fighting [non-Muslims]' and making difficult sacrifices such as living in caves, sleeping on rocks rather than sleeping in comfortable beds and with his wife, children and nice cars, Murguia wrote. If you are killed, "it's [heaven] straight away." Simpson said. "[Heaven] that's what we here for...so why not take that route?" In 2009, Simpson told the information he wanted to go to Somalia to wage jihad. "It's time," he said. "I'm tellin' you man. We gonna make it to the battlefield...it's time to roll ... People fighting and killing your kids, and dropping bombs on people that have nothing to do with nothing. You got to fight back you can't be just sitting down...smiling at each other..."
About a month later, Simpson "said he was tired of living under non-Muslims," Murguia wrote. "Mr. Simpson also said that non-Muslims are fighting against Allah and that his money and taxes are going towards their weapons." The Investigative Project on Terrorism has been told that both men have been involved in radical Islamic activities for years. Much less is known about Soofi. But his Facebook page featured comments critical of police, praising Hamas and showing an intense hatred of Israel. The FBI and Phoenix police are combing through the men's apartment and scrutinizing their computers and cell phones as well as contacting all known associates and family members. "This incident illustrates why this event was so urgently needed, and more need to be held like it. We will either stand for the freedom of speech against violent intimidation, or we will lose the freedom of speech," Geller said in a statement to the Investigative Project on Terrorism.